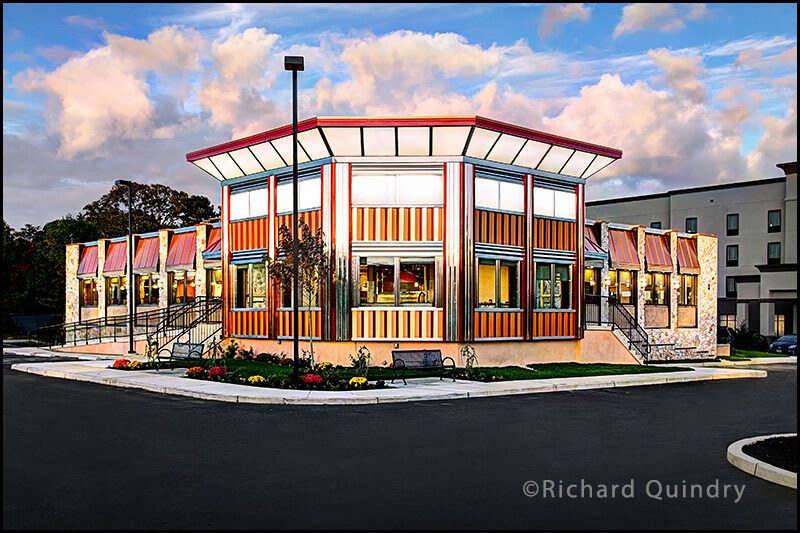 I was recently commissioned to shoot this restored diner for use in their ads and on their website. They requested a sunset shot which meant that the sunlight on the diner would also light up the hotel immediately behind it, causing them to blend together in a photograph. This caused a major visual problem that could only be solved during post-production. The job had to be done quickly as it was to have it's grand opening in 10 days and the trees were about to lose their leaves. After 5 days of rain we had our chance. Two images were blended together with additional Photoshop work to create the final image. The primary image was a shot of the building at sunset as requested. The other image was taken about a half hour later after dark to record the lights inside the diner. Some of the additional Photoshop work was darkening down the hotel, repaving the parking lot, removing the telephone pole and wires, removing the truck, the post on the right side and the light pole on the right which was forming a tangent with the edge of the diner. Anything that was not part of the main subject was removed or subdued in order to simplify the image as much as possible and to direct the viewer's attention to the diner. Great photos are usually not taken; they're made. I'm usually more subtle in my color palette but the building is pretty unconventional looking and I decided to play it up and give it a bit of a painterly quality. It's always fun transforming the ordinary into something extraordinary. 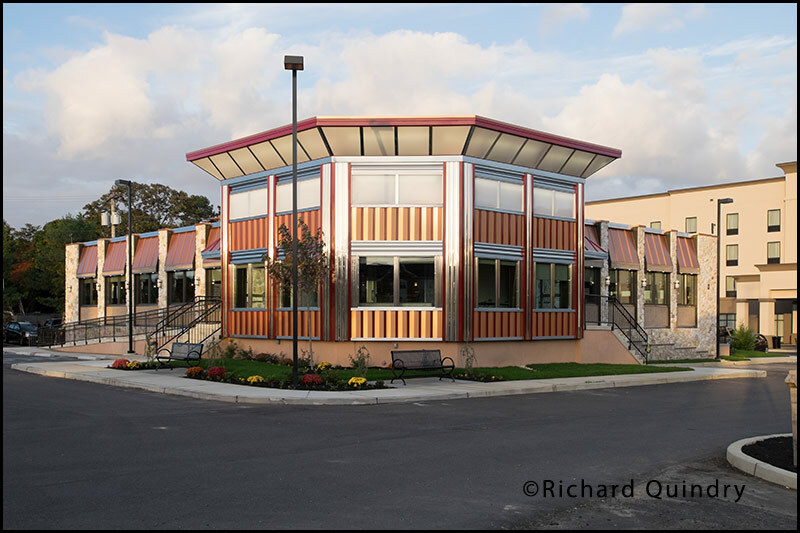 See more examples of my work as a Philadelphia architectural photographer. See more examples of my work as a Photoshop expert.